Formula One teams exploited the ragged edge of the aerodynamic regulations for 2017, so the series is reigning it in for 2018, reports Auto Motor und Sport. T-wings and big shark fins are out, but the beautification process doesn’t end there. The halo head protection system idea is dead in favor of a new solution called the shield. The F1 Strategy Group approved these changes at their meeting Tuesday in Paris. They voted to change the rules for the design area over the engine cover such that F1 teams would no longer have room to build big shark fins and T-wings (which are the neat loophole-exploiting mini-wings ahead of the larger rear wing). Motorsport.com has a useful visual analysis of just how the new regulations nuke these items from orbit here, for the curious. While T-wing was a neat, creative exploit of the current regulations, they have been a problem when they weren’t secured properly to the car. A loose Mercedes T-wing already damaged Red Bull’s car once this season, and Haas had to stiffen up their T-wing design after stewards said it flexed too much on track. The other item killed by the Strategy Group didn’t even make it into production: the halo. The Strategy Group, along with FIA president Jean Todt, killed it off due to its overwhelming unpopularity, according to Auto Motor und Sport. Over half the drivers were unhappy with the idea of turning their cars into the world’s most awkward flip-flop. Fans either felt it was a hideous break from F1's open-cockpit tradition or a half-baked compromise on head protection that didn’t go far enough. Nearly everyone thought the halo was unpleasant to the eyes. Fortunately, this isn’t a case of aesthetics winning out over safety, as Auto Motor und Sport says that F1 is still committed to bringing better cockpit protection to its cars in 2018. 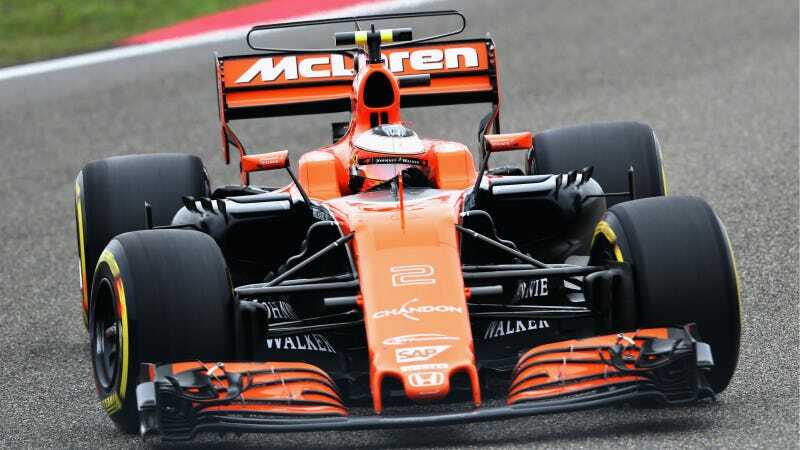 In its place, F1 will work on their new shield idea, which is a bit like Red Bull’s windshield-style aeroscreen, but at a more gradual angle. Given that the shield is a new idea F1 just approved, I’m incredibly skeptical that they’ll meet that 2018 deadline unless they’re building upon Red Bull’s existing research into the aeroscreen. After all, this is the same group that delayed the adoption of the halo when it was their preferred solution because they needed more time to test it out. From here, the rule tweaks go to the F1 Commission to be ratified, and ultimately to the World Motor Sport Council, but Auto Motor und Sport notes that those steps should be mere formalities. I can’t think of anyone who’s going to shout out their undying love for the goofy-looking halo device to hold that up.